Thank you Friendly Rooster for sponsoring this post. As always, all thoughts and opinions are 100% my own. It’s not always easy to head to the store with your kiddo to shop. Plus what mom doesn’t enjoy a little online shopping. With the seasons changing and you kid growing new shoes are constantly a must. Friendly Rooster is seriously an amazing company that carries adorable brands such as Tip They Joey, Pediped, Livie and Luca, Native, Me In Mind, Neon Eaters & Morgan and Milo. all of these brands they carry are considered the best baby girl and baby boy walking shoes. I’ll let you guys read more about the brands here. But… one more thing, the brands are socially and environmentally responsible and seriously ADORABLE. Tip Toey Joey is pretty exclusive and rare to find in the US as it comes from Brazil. 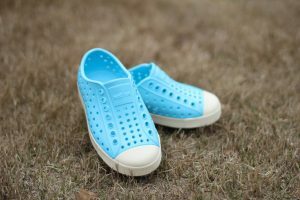 Also if you purchase any size or style of Tip Toey Joey shoes from FriendlyRooster, a new pair of Tip Toey Joey shoes will be donated to a beginning walker in need in the United States. 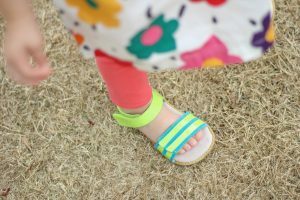 These little sandals are perfect for Izzy this spring and summer to explore the outdoors! She said, “wow” when we opened the box. My little fashionista was in love with her new shoes. Friendly Rooster has their 5 year anniversary this March and they are running some serious giveaways and discounts throughout the month to celebrate. You guys can sign up for their newsletter to learn more. Guys go check out Friendly Rooster for your baby girl or boy walking shoes and toddler or kid footwear. 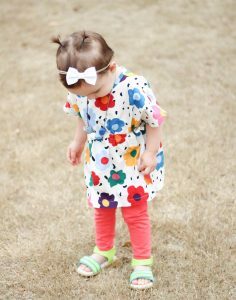 They are seriously so adorable and you are bound to find a style you LOVE! These are so cute! Love the bright colors! These are really adorable and perfect for spring! These are so cute! I’m going to go check them out for the kids! Awe thank you Shannan! We love fashion! All their shoes are so adorable!